Are you a fan of BEA ALONZO and want to meet and greet her? Here's your chance now to see her on March 20. 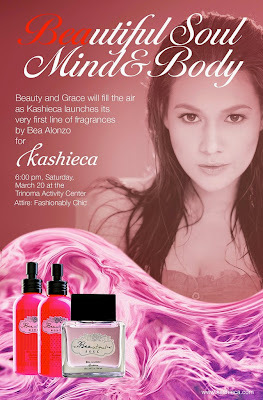 All you have to do is to purchase BEAutiful MIND or BODY spray by Bea Alonzo only at Kashieca Trinoma. Don't forget the date: MARCH 20, 2010, 6 PM at the Trinoma Activity Center. Side note: I can consider Bea Alonzo to have one of the beautiful faces in the entertainment industry here in Pinas. Her flawless skin is so noticeable and I'm not quite sure if she has ever had acne problems at all. Did she also ever think of using tazorac cream for her face? Maybe she is just born to have soft and clear skin that we can envy. Ahhhhh lucky girl! good girl talaga itong si BEA..gogog bea..we'll support you all the way!